The Washington Family Ranch in rural central Oregon had a problem last summer: With 400 youth guests per week, the Young Life-owned ministry camp’s expensive, network-based paging system was failing. Receivers were transmitting live pages in a staggered manner, creating unintelligible messages—along with guest confusion and complaints. 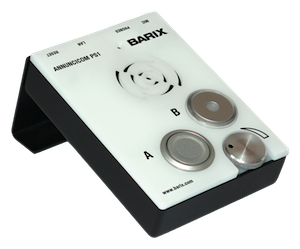 Barix Annuncicom PS1 master paging station. Based on the suggestion of audio engineer/integrator Alan Stricklin, Washington Family Ranch installed a multipoint Barix IP paging system this off-season. The system is fully tested and ready for the upcoming 13-week season, and delivering punch and clarity at all playout points thanks to low latency and improved audio quality. Enter Barix courtesy of Stricklin, who also uses Barix solutions at Minnesota Public Radio. The complete solution gives Pratt and his staff a compact, easy-to-use master paging station in the main office that connects over the network to playout points in high-traffic locations. Pages are streamed live to Barix IP audio decoders at these locations, which prepare and deliver the messages over loudspeakers. The result is clear messages for guests and staff in four dormitories, the main activity center, campus store, snack bar, dining hall, kitchen and main reception building. Pratt noted this is especially important in the event of a dangerous weather or a security situation, given the camp’s rural location. In addition to quality, Pratt cites low cost and simplicity as major benefits of the Barix IP Paging solution. The complete Barix IP Paging solution installed at Washington Family Ranch includes an Annuncicom PS1 master paging station and Barix Exstreamer 205 IP audio decoders at playout points—the latter of which include built-in amplifiers to reduce costs and infrastructure. Looking forward, Pratt expects to take advantage of Barix scalability by adding more playout points via additional Exstreamers and exploring multicast delivery to minimize network bandwidth.